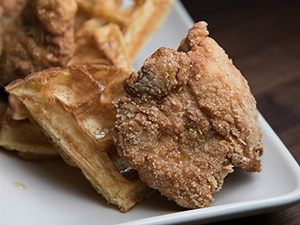 Chicken and waffles, a classic duo, is currently trending on many menus. To differentiate the pairing, chef Fraser dredges chicken thighs in a blend of rice flour, almond meal and cornstarch for a light but crispy coating and adds almond meal to the waffle batter, too. 1. Prepare chicken: In stainless steel hotel pan, marinate chicken in buttermilk overnight. 2. In shallow bowl, combine almond meal, rice flour, cornstarch and salt. Drain chicken and dredge in dry ingredients. 3. Prepare waffle batter: In large bowl, whisk eggs. Add milk, melted butter and vanilla. In a separate bowl, combine flour, almond meal, sugar, baking powder and salt. Add dry ingredients to wet ingredients in bowl; mix to blend. Set aside. 4. In small saucepan, heat syrup with thyme until simmering. Remove from heat; cool slightly. Strain out thyme. 5. In deep fryer, heat oil to 350 F. Fry chicken pieces until golden brown; drain on paper towels and keep warm. 6. To order, pour batter into waffle iron to make waffles. Serve chicken on waffles with thyme syrup.